I have paid very little attention to Facebook’s connections and the community pages it creates until yesterday. Yesterday I took a closer look at connections and my profile page. 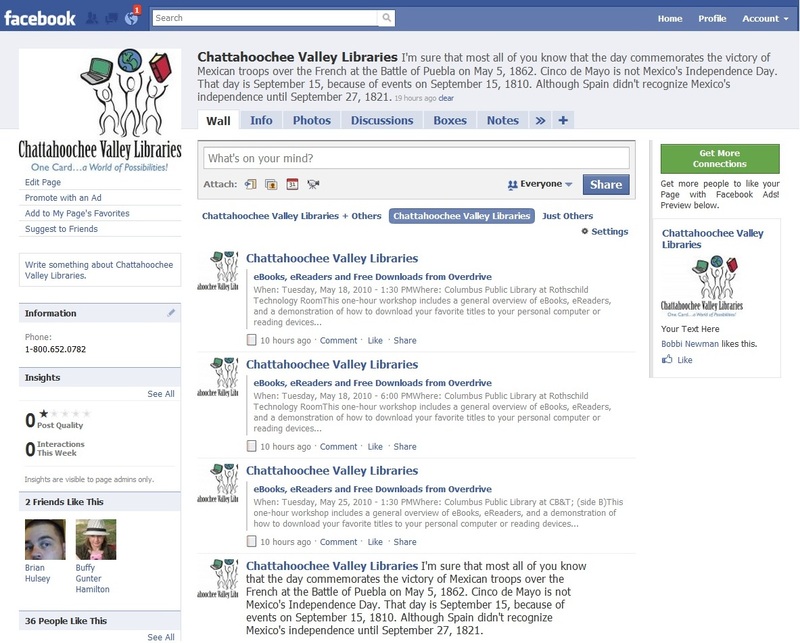 Now like many libraries my library has a Facebook page it looks like this. I kept the library in my work history when I click on that name on my info tab I see this – a community page. Our goal is to make this Community Page the best collection of shared knowledge on this topic. If you have a passion for Chattahoochee Valley Libraries, sign up and we’ll let you know when we’re ready for your help. You can also get us started by suggesting a relevant Wikipedia article or the Official Site. Now I’m not sure what caused the creation I suspect it was me leaving it my work history. Fine. Why didn’t it tie to the official page? So I start looking into community pages. * This is what I’ve been able to determine. Basically they are automatically created, you can’t control them and the content that is posted on the wall is pulled from mentions of the keyword(s) within Facebook. So if someone posts about your library it will show up on the wall like this. What does this mean for your library? You might have a Facebook community page. You might have more than one if there is any variation in the name or if you have branches. Anything anyone posts on Facebook with the keyword will show up on the wall. You can’t control it. You can’t respond to it. Even if you “like” the page it wont show up in your news feed so you would need to go there to monitor it. This maybe PRs worst nightmare. You can’t replace it with an official page, you can’t ask them to delete it. The only thing I can suggest is if you don’t have a Wikipedia entry on your library or business, get one up. Community Pages are a new type of Page that enable you to see what people are saying about the things that matter to you, and discover the friends and people who share these connections with you. They are similar to any other Page to which you can connect, although they won’t generate stories in your News Feed, and won’t be maintained by a single author. Where available, they also show Wikipedia content for the relevant topic, which Facebook has licensed under the creative commons license. We think your experience on Facebook will improve as your profile is turned into a living map of all the connections that matter to you, instead of a static list of your interests. How are Community Pages different from official Pages or Facebook Groups? Community Pages are built around topics, causes or experiences. Official Pages are maintained by authorized representatives of a business, brand, celebrity, or organization, and they can create and share content about the entities that they represent. Community Pages, on the other hand, won’t generate stories in your News Feed, and won’t be maintained by a single author. While Groups allow you to communicate directly with other people on Facebook about a specific subject, Community Pages simply enable you to learn more about and see what others are saying about additional topics that interest you. Can I edit the content on a Community Page? How can I tell the difference between official Pages and Community Pages? Community Pages have slightly different content than official Pages. When available, they display a primary picture straight from the Wikipedia page of that topic, along with an info section also from Wikipedia. Related posts from other people on Facebook will also be displayed in real time. However, since Community Pages are another type of Page, we don’t differentiate between them when listed on your profile or in search results. What if there isn’t a Wikipedia article for a Community Page topic? Community Pages are meant to be the best collection of shared knowledge on topics that interest you. Where available, they show Wikipedia content for the relevant topic, which Facebook has licensed under the creative commons license. If we can’t find the right article from Wikipedia, we might be asking for help from the community. You may see messaging on these Community Pages inviting you to make these Pages more useful and interesting by signing up to contribute in the future or by suggesting a Wikipedia article. Worse yet, at least three libraries in my region have been notified that their official page has been “reclassified as a community page.” The notification provides no information on what this actually means, so the page admins initially ignored it. Libraries can appeal. Still very confused about the difference between official (business) pages and community pages. If you create an official business page, does the user profile attached to it still represent the company, or does the company represent the company?